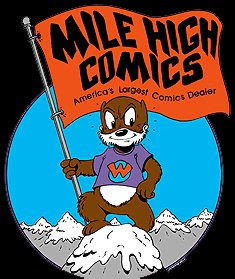 There have been more than a few pieces recently commenting on Chuck Rozanski's decision to not set up a Mile High Comics booth at Comic-Con International for the first time in 40-some years. As he explained in his newsletter, it basically boils down to the math -- rising costs and shrinking revenue. He's actually cited this trend the past few years, and as I recall, he seriously considered dropping the show last year. I first became aware of Mile High Comics back in the early 1980s via the ads they would take out in various comics. The ads were visually unattractive, just a full page (or two!) listing of comics for sale, but they proved to be very functional. They told you what comics they had available and how much each cost. If you couldn't find what you were looking for at your local shop, and travel to the nearest convention 150 miles away wasn't a regular option, this was clearly your best way to get back issues. (This is all pre-internet, of course.) The first check I ever wrote was actually to Mile High Comics, ordering around a dozen back issues of, I think, Marvel Two-in-One. Mile High certainly wasn't the only one to use that approach, nor were they the first, but they often had a better/broader selection than most anyone else's advertised listings. I don't recall precisely how soon they jumped into internet sales, but their early site presence was basically a long-form, digitized version of their ads. That is, it consisted of hard-coded lists, and you had to write down what you wanted in an email or fax and send the that over to them. They could accept credit card payments, but you had to write your card number down and send that along for them to process manually. I know that they teased for a while a searchable online catalog, but it eventually went live in 1998. You were then able to scan through their entire stock (not just the titles that someone keyed in manually and may not have updated recently) and click which comics you wanted to order. Again, with their huge inventory, it made finding normally hard-to-find comics easy. Particularly if you were looking for a number of different titles/issues, and didn't want to pick them off one at a time in ebay. Rozanski saw that the internet was going to become the primary way to sell back issues, and he updated his business model accordingly. It took some time, and probably cost a lot of money, but it's kept him as a relevant retailer for the past two decades. but have they updated their business model in those two decades? The Mile High site has remained essentially unchanged, with only a few superficial modifications to the front end. You can still run a title search, but the results appear in a seemingly random order (if I recall correctly, it's based on most popular results, but there's nothing that says that currently) and clicking the button to add any given issue to your shopping cart provides no feedback letting you know the task has been completed. Not to mention that the whole site design and structure looks like it's trapped in the late 1990s, with links for EVERYTHING running down the sides of the home page. Technically, the site does use a style sheet, but it's very rudimentary one. The site still works, but it's not a great user experience. And in light of ebay adding more of a shopping cart functionality and Amazon allowing third parties to sell through their site, Mile High's previous benefit of having tons of stock in a single location becomes less of a selling point since users can do much the same thing elsewhere. Even though they may be buying from multiple sellers, the unified check-out process means that it may as well be a single seller from the purchaser's point of view. They don't care how many people their books come from, or how many individual packages show up on their doorstep; they just don't want to have to enter their credit card information several times. Rozanski is right that the demographics of Comic-Con have shifted away from his favor. He noted that a lot of people don't even come into that exhibit hall, in favor of attending the various off-site parties and events elsewhere in the city. But this is part of the broader shift from purchasing "stuff" to purchasing "experiences." That was the underlying message at D23 last week -- that whole Star Wars themed hotel they announced is about a full extension of that as is currently possible. If I want a "thing" I can order it online. In many cases, I probably don't even have to pay for shipping. The two things I'm going to be looking at are the price and the ease of the purchase. Mile High prices their books fairly (when you consider they under-grade most everything) but not cheaply, so they're rarely going to win on price. And if they don't continue investing in the purchase experience -- either online or at shows -- their customers will look elsewhere. One of the challeges in today's marketplace is that things are changing constantly. What worked forty years ago won't work today. What worked twenty years ago won't work today. What worked five years ago might not work today. The Red Queen told Alice, “My dear, here we must run as fast as we can, just to stay in place. And if you wish to go anywhere you must run twice as fast as that.” I don't know that Lewis Carroll had 2017 business models in mind when he wrote that, but it definitely applies today!